How to use a Belt Sander including information on how to change the sanding belt. This project explains when and where it is most appropriate to use a belt sander and gives you some tip and tricks to use them most effectively. Also understand what to look out for when choosing a belt sander. Sanders come in many forms, but a belt sander is a power tool which uses the process of a continuous revolving abrasive paper belt to shape, remove and prepare (usually) a wooden surface or item. The belt sander consists of an electrical motor, two rollers, one of which is a powered roller (normally the rear of the two) the front roller is the tensioning and guiding roller. 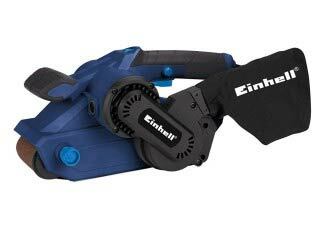 Belt sanders can be mains electric or battery powered tools. 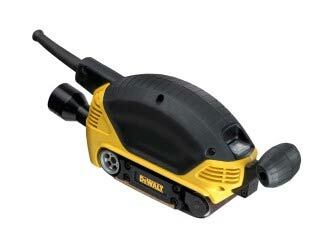 For larger works we recommend using the mains powered belt sander. These tools normally come with detachable dust collecting bags as there will be a lot produced while using this sanding machine. When using the belt sander always make sure you have a good grip before you switch it on. The trigger on/off switch is not a clutch trigger it’s an immediate action switch. Treat the sander with respect. There is no need to be aggressive as you will end up burning the wood you are sanding. If it’s a timber floor, this could be a very expensive error. Use a gentle forwards and backwards action while sanding. Never hold the sander stationary while still in contact with the material you are sanding. This will leave an area of lighter or a differing finish to the surface of the timber you are sanding. Depending what type of surface you are sanding or the kind of finish you are trying to achieve will decide which type of abrasive grade sanding belt you use. See our project on sanding a timber floor for a description of the different grades of sanding belt and paper. You will also get more information from our project on hiring floor sanders. Eventually you will have to replace the sanding belt when it has worn down with a new one. This is not a hard process. Sanding belts come in many sizes and many differing grades for use, please ensure you use the correct grade for the surface you are working on. There will be a tensioning bar on the belt sander which will, once released, let the tension out of the (usually) front rotating drum. This will allow you to remove the sanding belt and insert a new one of the grade you need. Always make sure you check on the inside of your sanding belt as it will have a directional arrow showing which way the sanding belt has to rotate when in use. Make sure the sanding belt is positioned centrally to the rotating drums before you tension up the sander. Return the tensioning bar to its locked position, the front drum will move forward taking up the tension and allow you use your device. Belt sanders are mainly used for more aggressive sanding situations but if used with respect and gently can be used for sanding and preparing woodwork for painting. When using your belt sanding device always check that the item you are sanding doesn’t have any items like nails or screws protruding. These will destroy the sanding belt instantly as the belt is rotating at high speed. 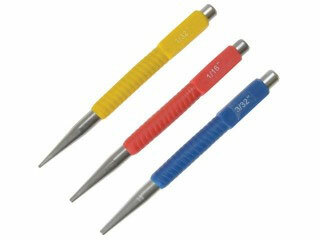 Screws can be withdrawn and nail heads punched down with nail punches. Most power tools have a continuous use lock button which if using always remember to disengage the lock button before you stop sanding, otherwise you will have a very dangerous power tool tearing around your work area doing damage to you or your work. This is a machine that runs at speed and does not stop immediately when switched off, so certain precautions need to be considered. You need to make sure that the clothing or overalls you are wearing do not have any loose or dangling parts as you do not want to get them caught in the sander. You should also consider tying up long hair this could be a very dangerous and painful experience. As always with power tools that create debris and dust DIY Doctor recommend the use of gloves, dust masks and eye protection.